Accordingly an operation was underway on Tuesday to evacuate thousands of tourists who were stranded after a deadly earthquake jolted Indonesia's Lombok Island killing 98 people and injuring over 200 others. 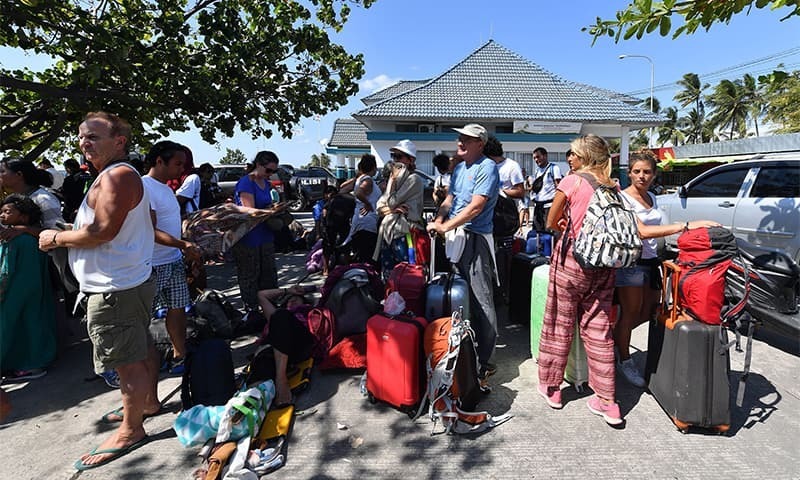 Recently a video released by authorities showed hundreds of people, many believed to be foreign tourists, crammed onto a beach on the island of Gili Trawangan as evacuation measures got underway. Moreover the island famous for its white sandy beaches and clear waters is located near the epicenter of the 6.9 magnitude quake on Lombok that struck on Sunday evening. Earlier rescue efforts were hampered by shallow waters, but rising sea waters have paved the way for nine ships to dock on Gili Island. So far, up to 2,700 tourists have been moved from the Gili Island. Presently Lombok's airport was open around the clock and had significantly increased its flight schedule. Further the epicenter of the quake was in northern Lombok, a more residential, less developed part of the island and the majority of Lombok's tourist resorts are on the island's southern coast and an estimated 20,000 people have been displaced by the massive earthquake. Reports added rescue teams on Tuesday also continued searching under debris from collapsing buildings for more survivors.